Over the Labor Day weekend, I labored in my garden. MacKenzie assisted me. She loves to help. Black-Seeded Simpson: a light green, delicate lettuce, that Husband feels is too wimpy. I think it is a good complement to the tougher lettuces I grew this year. Galactic: a deep red, stunning lettuce, that toughened way-too quickly for my taste (pun). It’s pretty looks weren’t enough to counter its diva behavior. Garrison: a red oak-leaf lettuce that was pretty, but not tasty. Off the list for next year. Winter Density: a romaine that was the clear winner this year. Pretty, tasty, and long-lasting. So I pulled the last of the bolted plants, weeded, raked, and dug narrow trenches to re-seed the bed with spinach — hoping to get one more crop before frost. Then the Labrador helped. 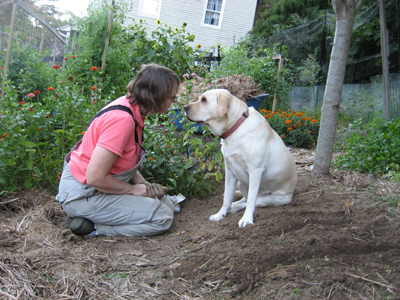 She sat smack in the middle of the bed, and when I asked her repeatedly to leave, she only heard “I love you,” and wagged her tail, erasing my neatly dug trenches. She was certain she was sitting in exactly the right spot. No amount of reasoning worked. I stated the obvious: “You are in the way!” and she smiled in appreciation at all the attention. So I got up, walked around, and she followed me. I sat down again, patting the garden path next to me, and she got the idea. I was able to re-seed with spinach, as planned. I will remember this: when things are not going your way, just get up and walk around, and then sit down in a different place. Things really could be as simple as that. The feeling is mutual! She is the perfect companion. She wants to be by our side, wherever we are, although the garden is one of her preferred spots. Lots of chipmunk scents to follow, and bees for her to chase! She also thinks tomatoes are delicious! Lucky for me, she doesn’t eat them unless she can taste the inside….otherwise I fear she’d be eating them right off the vine!